Pre-orders include Black Agumon and Gabumon, more. 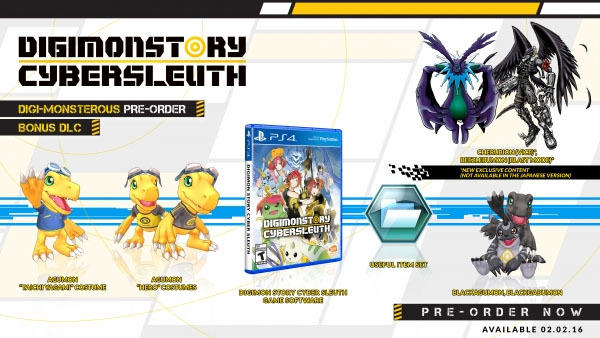 Digimon Story: Cyber Sleuth will launch for PlayStation 4 and PS Vita in the Americas on February 2, Bandai Namco announced. The PS Vita version will be available digitally, exclusively via the PlayStation Store. Find a fact sheet below. Log-In to Solve a Digital Mystery Infecting the Real and Digital Worlds! In Digimon Story: Cyber Sleuth, scan, raise, and train your faithful Digimon companions to battle by your side against a group of hackers.